This post is partially complete and several sections may require editing and proof-reading. The contents on the history of the organization of a VSAM File, CI and CA splits is under updation. Each peripheral device such as a disk-drive or a tape cartridge has a different geometry, organization of data. Programs often process the data on a disk/tape. An application program must then contain logic to communicate with various I-O devices. An access method is a software (bunch of tiny programs) to write device independent code. 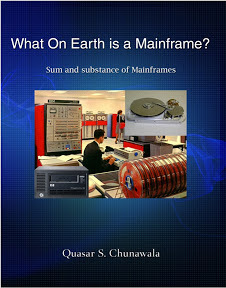 What device drivers are to Windows operating system, access methods are to mainframe zOS. Access methods assume the burden of interacting directly with the hardware. Developers can include high-level business logic, and avoid the gory details of the specific hardware in their program source-code. Access-methods are an interface between the program and the hardware device. VSAM is one of the several access methods in the zOS. VSAM makes it easier for application programs to execute an I/O operation. There are several other access methods - QSAM, BSAM, ISAM etc. QSAM is an access-method used to read/write data from Sequential Files. QSAM stands for Queued Sequential Access Method. QSAM queues records from the file, into an area of the main storage called System buffers. This speeds up the execution of the program. The "V" in VSAM stands for Virtual. VSAM is an access method used to read/write data from direct-access devices, such as disk-drives.